I love a good pasta salad and this orzo salad does not disappoint. 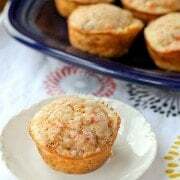 Fresh flavors, easy preparation and great at room temperature or straight out of the fridge. Winter is all about soups, stews and roasts, but summer? Summer screams salad. So do bikinis. Bikinis scream salad loudly (and probably not pasta salad). But I kissed bikinis goodbye and said hello to my cute kids…and stretch marks. But let’s be honest — bikini, tankini, one-piece, t-shirt over your swimsuit, birthday suit (?!? ), a little salad is always a good thing. Okay yesssssssssss I know this is a PASTA salad. Whatever. Minor details, people. 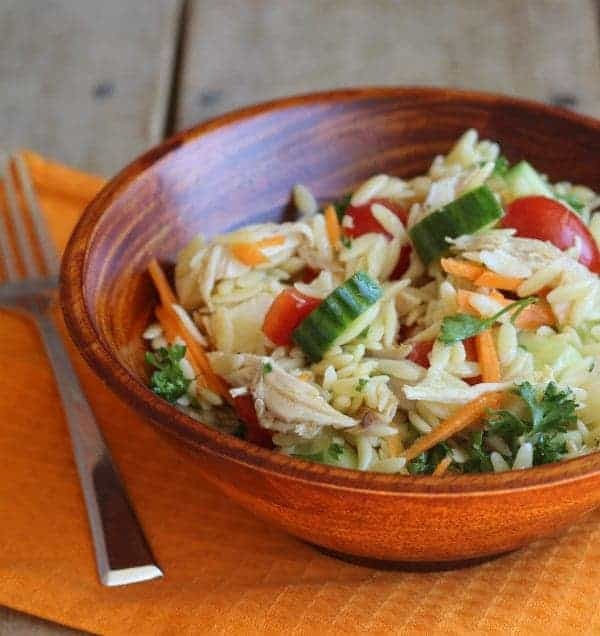 This orzo salad is a quick, easy meal that is refreshing and delicious. 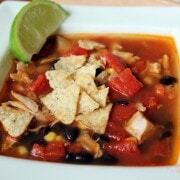 Leave the chicken out and add some beans or tofu for a great vegetarian meal. Cook pasta as directed on box. Strain and transfer to a very large bowl (it needs room to cool as well as room for all of the other ingredients–and stirring room!). While the pasta cooks, prepare dressing. In a small bowl, whisk together lemon juice, mustard, shallot, oil, salt and pepper. Add dressing and chicken to warm pasta and toss to combine. Place in fridge to chill. While the pasta is chilling, prep your vegetables and parsley. Add them to cooled (or mostly cooled) pasta and chicken mixture. Serve immediately or store in fridge until ready to eat. Verdict: Loved this! I used a rotisserie chicken — it was a grocery store day and I love having a quick meal to throw together when I get home from the store. Husband’s take: He loved this too. He had seconds, and thirds. E liked it a lot too. Changes I would make: None are necessary but this is the kind of thing that you could throw in any vegetables that you have in the house. 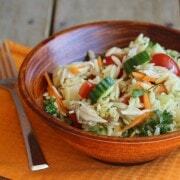 More Orzo and Orzo Salad Recipes! This is wonderful! Very easy to make. The hardest part is chopping the parsley, seriously! My wife doesn’t like peppers, so I left them out. I added some kalamata olives to round out the flavor profile. Great for a picnic dinner at the Hollywood Bowl with a fresh fruit side and a nice bottle of wine. I guess we are in the same boat called “Mom” here. I guess what’s left for us to look forward to this summer is salad. I guess you can personalize your Orzo salad and use your preferred vegetables too, right? I love salads because they don’t require me to formally sit around the table to eat. I can simply take my bowl to the living room and eat. i love the idea of orzo vs. just regular pasta…sometimes the pasta noodles can feel so heavy in the salad…orzo sounds perfect to me. oh this looks so good! 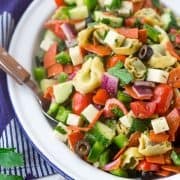 I love pasta salads and I love that you added chicken to this one! Oh man does this look good! Making me so hungry. i have some leftover orzo that i need to use up and this sounds like a fabulous way to do it! What a yummy looking salad, plus it has orzo in it! I happen to LOVE orzo, I can eat orzo all day long. 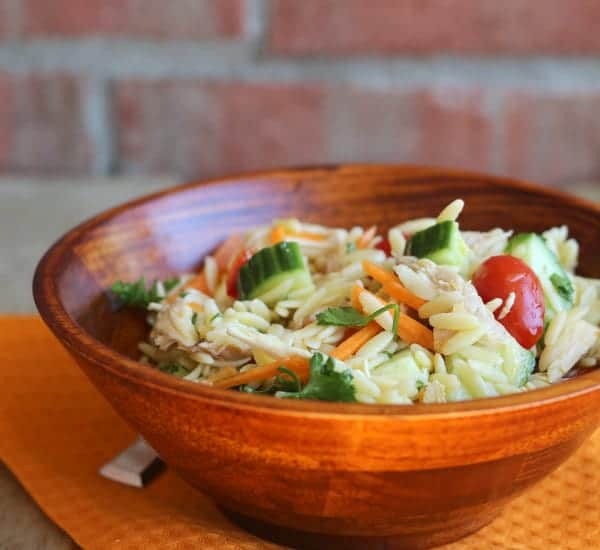 I said good bye to bikinis a long time ago, but there is always trying to look good in a one piece to worry about :) I love orzo, and this is a great salad! Holy yum! This is totally up my alley for an easy, fresh weeknight meal! Love it, Rachel. This is SOOO my kinda salad!! Simple, fresh and delish! Love making salads with orzo! This is my kind of summer salad! I just love orzo and needed a good reminder to get some into a salad. This did the trick; looks great! This is my kind of summer meal! Every year I put bikini’s out of my mind for as long as possible, and then suddenly – ‘Tis the season!! Bikini or no bikini, I want this beautiful bowl of goodness for lunch today! This looks so light, refreshing and delicious! Orzo makes such a great pasta salad!! I could eat this any time of day, looks great Rachel! This is definitely a perfect salad in my book! Love that you can just throw whatever you have in there and I bet it will still taste delicious!